Healthy Food for Diabetics !! Diabetes is a disease characterized by high blood glucose levels that result from a reduced ability of the body to produce and/or use insulin. This disease can be kept under control by healthy living and good eating habits. On this page, I am outlining some good eating practices and recipes that I have gathered over the years. In the last few months I have received a lot of queries about diabetic diets. I have replied to many of my readers by mail, but it is time to write in the site about this worldwide problem. Usually doctors make a healthy meal food chart for their diabetic patients. Diabetics are asked to cut on carbohydrates, sugar, refined food etc in their daily diets. Doctors also often suggest that diabetics should eat 5-6 small portions of food, rather than 3 big meals. In Indian vegetarian diet the daily meal comprising items such as dal, sabji, roti is considered as a healthy and balanced diet. So, if you have a diabetic at home you don’t need to make any extra effort. 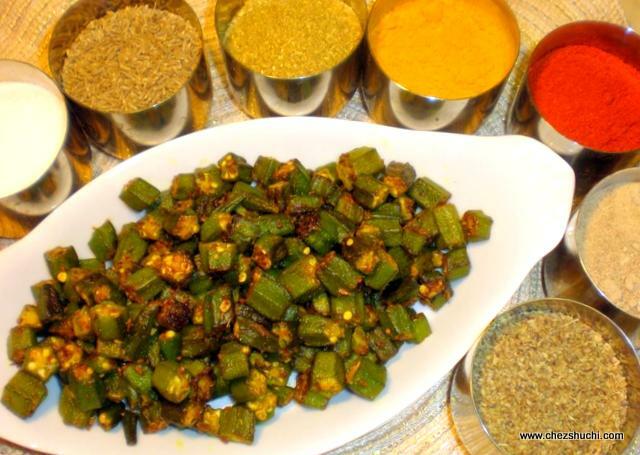 For example, if you are making a vegetable dish comprising greens and potatoes (such as Methi Aloo), you can serve only the greens to a diabetic person. One can serve barley roti and regular dal with less oil. Along with a healthy diet, exercise, yoga, and meditation also help to control diabetes. A happy and stress free family environment also helps reduce the health issues. I hope this information helps you. Take care! For diabetics, there is no restrictions for lentils. Lentils are a good source of protein for vegetarian and vegan diet. Split lentils are considered easier to digest compared to beans. This is because beans (such as kidney beans, chickpeas, soybeans etc.) are high in protein; therefore, these should be eaten in lunch meal as it becomes much easier to digest them. When you make any lentils and beans preparation, make sure to cut down on fat (ghee/oil). Read about lentils and beans recipes. For diabetics all kind of light soups are healthy. Please avoid using cornflour or any other thickening agent in the soup as these are high in carbohydrates. Also make sure to avoid fresh cream and extra butter in the soup. Use fresh ingredients and try making clear soups. Read more about soups. Idlis are steam cooked savory cakes. These healthy and delectable idlis are made with oat, semolina, carrots, yogurt, and raisins, and have been seasoned with mustard seeds and curry leaves. You can make changes in the recipe as per your need. Please do share your comments about these idlis.. When you are making Roti for diabetics use barley flour over wheat flour beacause the carbohydrate is less in barley and also barley is a rich source of fibres. Also you can add some kind of chopped greens like, methi leves, palak, mustard etc in your daily breads. This recipe is for a very healthy and nutritious Indian bread. My kids, who are not big fans of cabbage and spinach, just loved this bread. Oat is rich in dietary fibres, and minerals. It is considered very healthy. Along with spinach, cabbage and carrots this Indian bread provides wholesome nutrition. You can add more veggies as per taste. Serve this delicious bread with your choice of vegetables...please do share your comments after making this bread! Kale is one of the healthiest green leafy vegetables. It is also often called as a super-food. Kale is very rich in Vitamin C, Vitamin A, Vitamin K1, and fiber. It also has a lot of essential minerals. Kale belongs to the family Brassicaceae (old name Cruciferae). Some other common vegetables of this family are mustard..
Methi is a Hindi word for Fenugreek. Fenugreek is an annual herb with a lot of medicinal values. Fenugreek leaves are rich in magnesium, iron, calcium etc. This recipe is for pan fried Indian breads with fenugreek and paneer stuffing. Methi Paneer paratha is perfectly fine for Diabetics as well. is staple Indian bread eaten in every corner of India. Rotis are made with whole wheat flour and are healthy and delicious. In different parts of India they are called with different names like Phulka, Chapati, etc. .. When you are making curries for diabetics make sure to cut down on oil/ghee(fat). Use lots of greens in curries. Avoid using any cream in diabetic food. Palak paneer is a very famous paneer dish. Paneer is an Indian cottage cheese prepared from fresh cow or buffalo milk. To prepare paneer, usually lemon juice/ vinegar/ citric acid / yogurt is added to boiling hot milk to separate the curds from the whey. Paneer is a good source of proteins, carbohydrates and calcium for vegetarians.Spinach has a high nutritional..
Sugar is one thing which diabetics are not allowed to eat. Some people use substitute sugar in their tea, coffee, desserts etc. I think it’s better to avoid sugar for diabetics in daily meals. If you control your diet on daily basis then occasionally you can have dessert. I will suggest using a little bit of regular organic sugar instead of artificial one. When you are making desserts for diabetics make sure to cut down on sugar. Use as little sugar as possible. Also cut down on fat also.